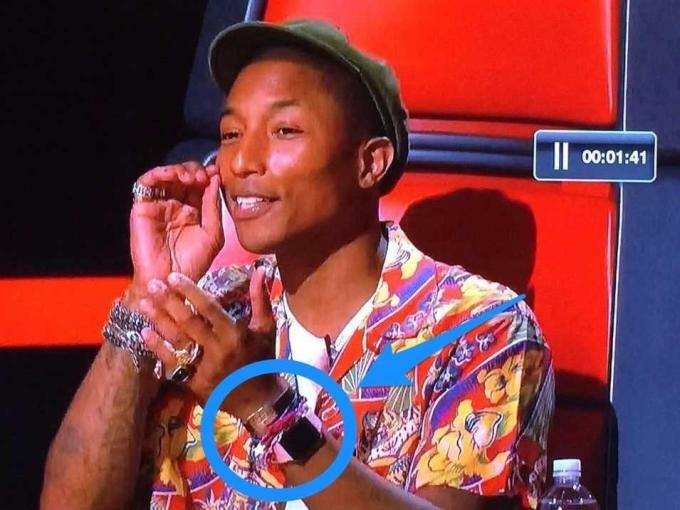 Pharrell was seen on last night&apos;s episode of The Voice wearing the Apple Watch, which isn&apos;t even up for pre-order for the rest of us until April 10. Until now, only Apple employees and executives, like Tim Cook who wore the accessory at last night&apos;s NCAA Championship game, had been seen wearing the new watch out. However, if anyone was going to get a chance to put this on his wrist before virtually everyone else, it would be Pharrell. The singer even took to his Instagram to prove that the watch was legit. In typical Pharrell fashion, it appears he&apos;s mixed the most expensive watch—the $10,000 gold "Edition"—with the cheapest band, a white sports version. Apple has been very proactive about appealing to the fashion community. The tech giant took out a 12-page ad spread in Vogue, and even poached executives from fashion houses and brands, including Saint Laurent, Burberry, Levi&apos;s, and Nike​, in anticipation of the release. Despite the efforts, some of us still aren&apos;t sold on the Apple Watch. But if there&apos;s anyone who can make the Apple Watch appear stylish, though, it&apos;s this year&apos;s CFDA Fashion Icon of the Year Pharrell. The Apple Watch is available for pre-order starting April 10 at midnight.